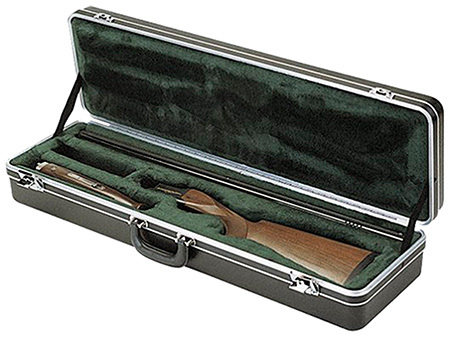 SKB ATA airline transportation association rated cases are molded from ultrahigh molecular weight polyethylene. The case color runs through the material so scratches are invisible and the poly" is impervious to all solvents oils fuels and acids. Every case detail is purposefully designed to optimize function. The moldedin configuration of bumpers and ribs are designed to absorb shock and vibration as well as provide protection for exposed hardware. The aluminum valance on SKB cases provides a reliable "tongue and groove" closure and a neoprene "oring" gasket keeps out harmful moisture. Attach style HDPE shell holds barrels to 30". Weather resistant oring seal solid die cast zinc locks with chrome plating."